Sadly, strawberry season is over in these parts, though fortunately I picked enough strawberries a few weekends ago that I will have plenty to bake with in the coming months. Thank goodness for freezers! Months ago I purchase some adorable little tartlet pans but had not yet used them for anything so I decided to amend the situation this past weekend. I also have been meaning to experiment more with gluten-free baking since it intrigues me and I have many gluten-free flours in my pantry, so when I found a pate sucre (sweet crust) recipe from my La Tartine Gourmande cookbook I was inspired to marry it with some freshly picked strawberries in said tartlet pans. The recipe called for sweet white rice flour which I have plenty of but also quinoa flour which I did not have. I found it in a local health food store but it was crazy expensive but since I always have actual quinoa in my pantry I decided to go DIY and grind it into flour myself. Many websites advised toasting the quinoa before grinding it into flour I ignored that and just ground it down using my coffee grinder. I was a bit nervous how it would turn out because quinoa can sometimes be a little bitter but in this particular recipe there was enough else going on (namely confectioners’ sugar) that it turned out fine. Next time I may try to toast the quinoa before grinding, however, and I will let you know if it’s worth it or not. I did research for the strawberry filling but wound up shooting from the hip since a lot of what I was finding seemed more complicated than it needed to be. I wanted to keep it simple with strawberries as the main star. The one (simple but) slightly fancy thing I did was to use the seeds from half of a vanilla bean pod to scent/flavor the sugar I used to macerate the strawberries. It’s so easy to do but makes the dish more luxurious. Sprinkle the vanilla-infused sugar on top of sliced strawberries and let the berries macerate for about an hour. 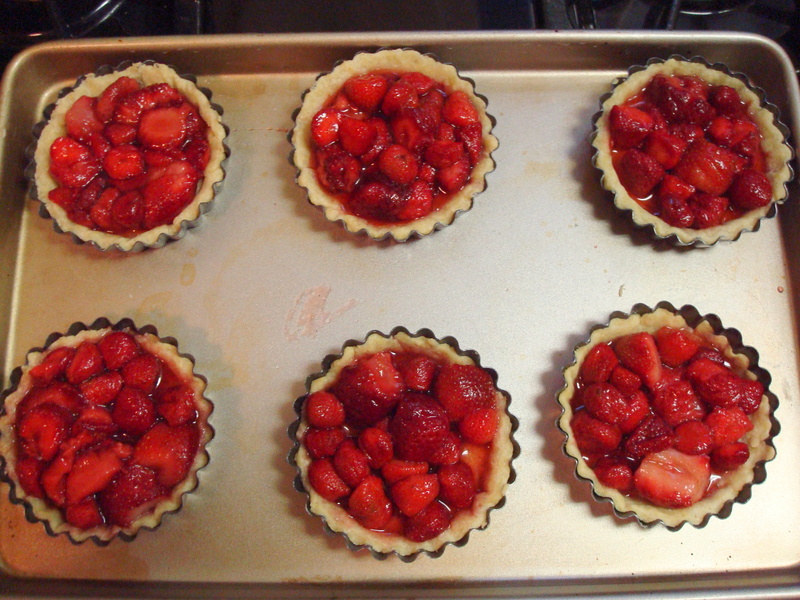 Then pour the berries into the pre-baked tartlet shells and bake for about 10 to 15 minutes more in the oven to let the strawberries roast a little bit. The tartlets are best served warm from the oven, and if you wanted to serve them with a little ice cream, whipped cream, or even a dollop of mascarpone cheese I would say that you and I should be friends. In the bowl of a stand mixer fitted with the paddle blade, combine the flours, cornstarch, xanthan gum, and confectioners’ sugar. Work on medium speed to obtain a fine mixture. Add the butter and work again until crumbles form. Add the egg and work until the dough detaches from the bowl and forms a ball. Wrap in plastic wrap and refrigerate for a minimum of 3 hours. Bring to room temperature before using (about 30 minutes, when the crust doesn’t feel hard). Using gluten-free dough, generously dust work surface and rolling pin. 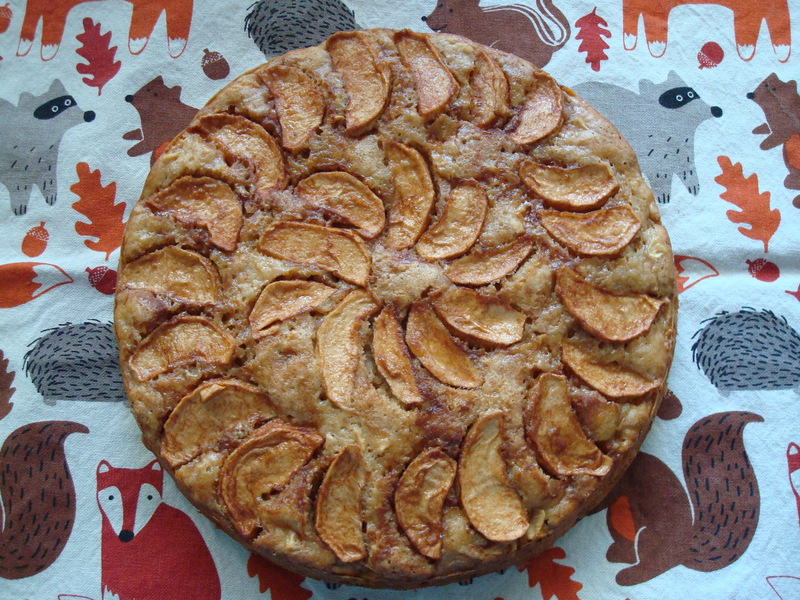 Roll out room-temperature dough to circle slightly larger than 10-inch tart pan. If you are using tartlet pans as I did, the shape of the rolled-out dough doesn’t matter so much as you will be fitting it into smaller pans. 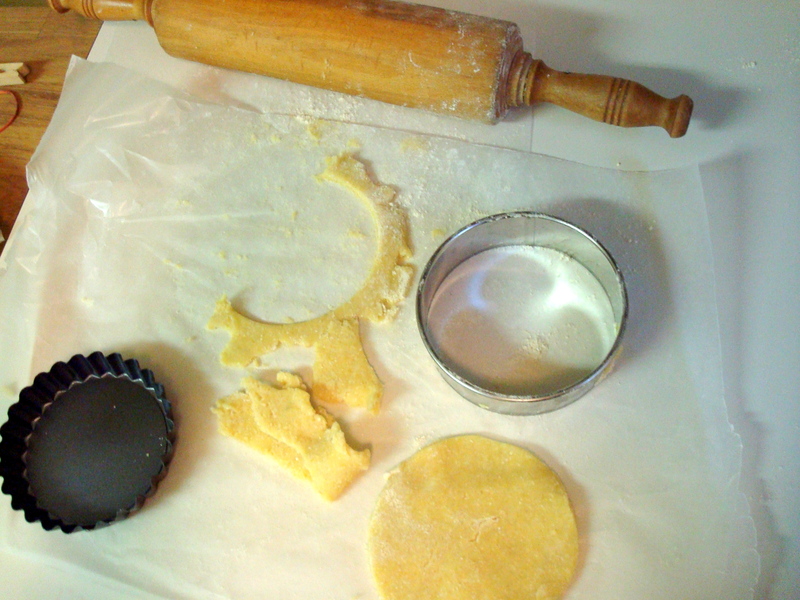 I used a floured biscuit cutter to portion out dough for the tartlet pans but use whatever method you feel is best. 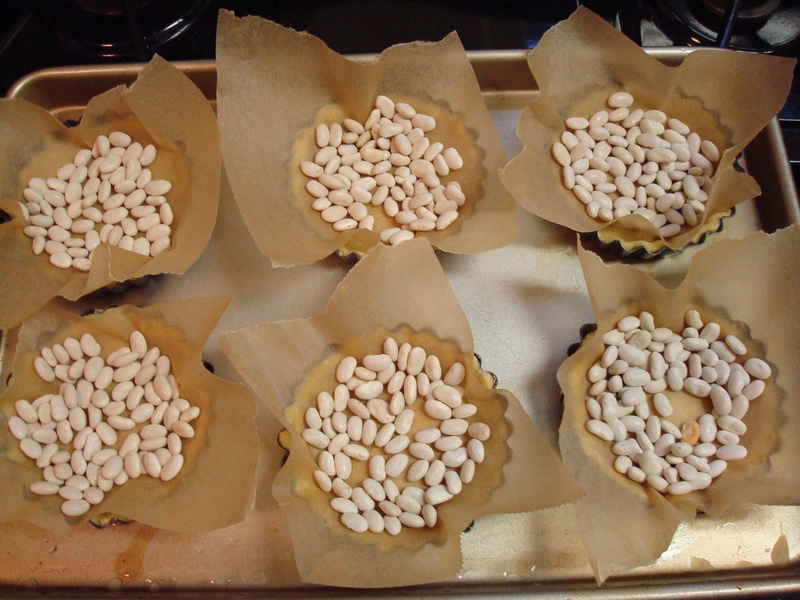 Preheat oven to 350 degrees F. Once you have rolled out the dough and pressed it into the tart mold(s), cover it with a piece of parchment paper, and top it with pie weights (dry rice or beans work too). Bake the crust for 10 or 15 minutes, until light brown. Slice vanilla bean pod in half and set half away for use at a later time. Scrape the seeds out of the half you are using into a small bowl. 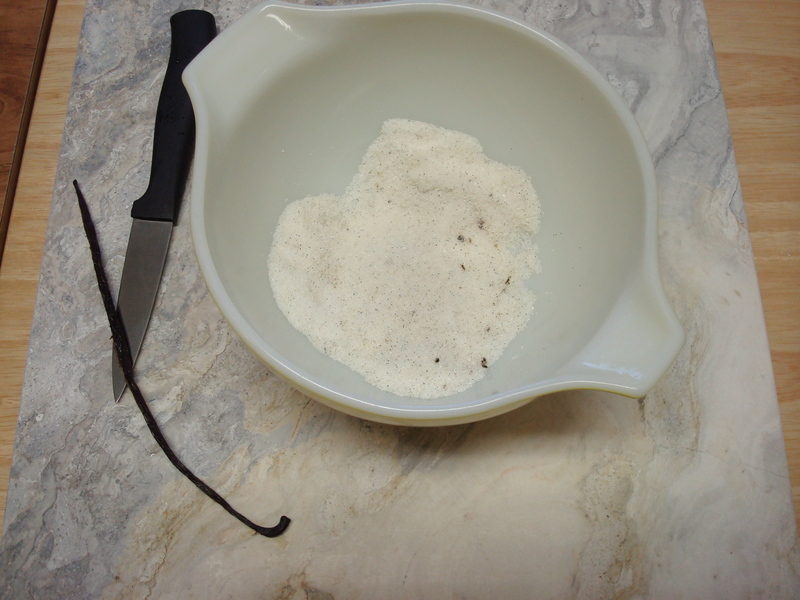 Pour sugar into the same bowl and use clean fingers to rub the vanilla seeds into the sugar. 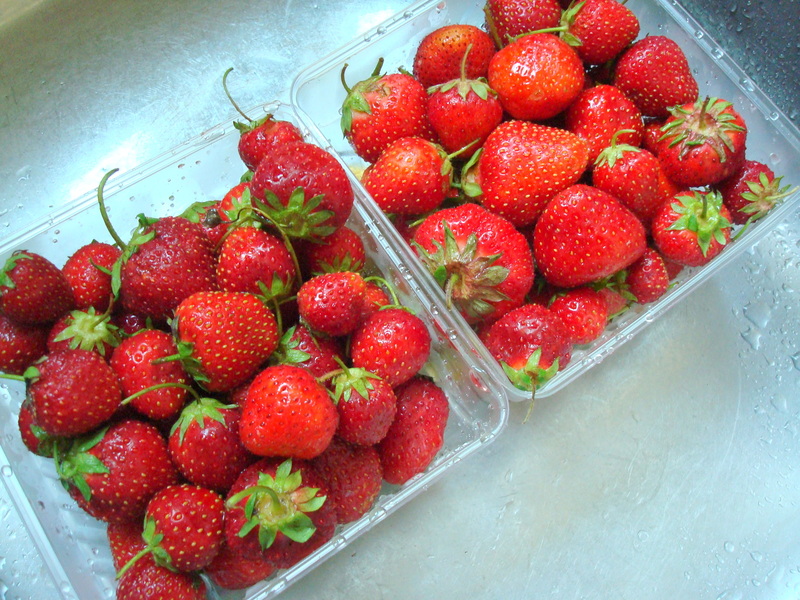 Place sliced strawberries into medium-sized bowl. Sprinkle vanilla sugar mixture over the top and let berries macerate for about an hour. 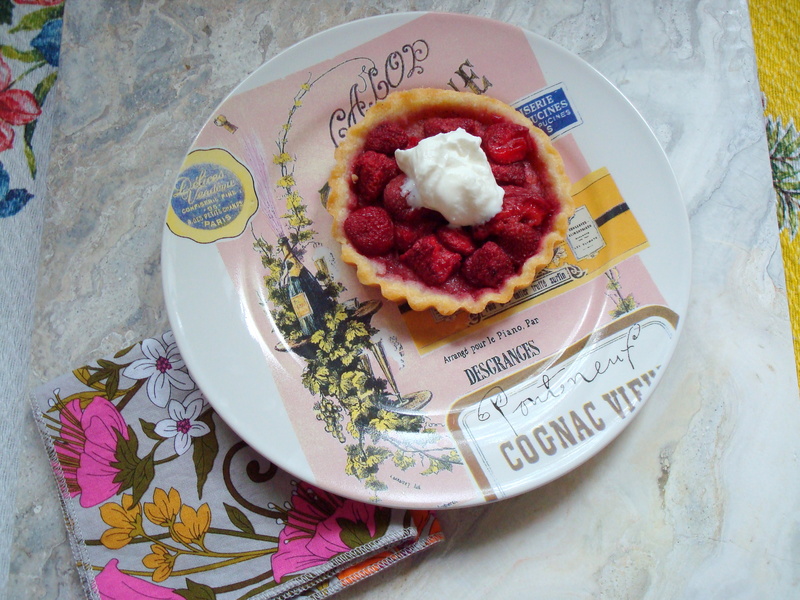 After berries have macerated, pour into pre-baked tart shells and bake for an additional 10 to 15 minutes in preheated 350 degree F oven. Enjoy tartlets warm with a dollop of ice cream, whip cream, or mascarpone cheese. I love pie. A lot. I also love that others love pie so much that there are entire bakeries, blogs, and cookbooks devoted to just it without cupcakes or cookies or other filler. One can do a lot with pie. 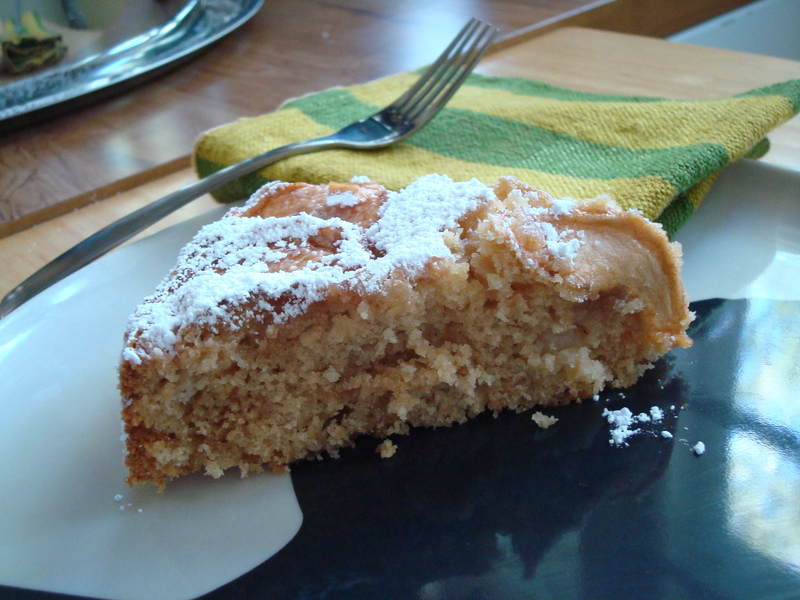 Recently I purchased one of the aforementioned pie-only cookbooks, “A Year of Pies” by Ashley English, and have tried out a few of the recipes including the star of this post, an apple pie made with chai tea spices. Now I love me some chai tea and it totally sounded like a very clever and logical thing to do to pair it with apples, and boy was it. The cinnamon, nutmeg, cloves, cardamom, and black pepper (yes, black pepper!) 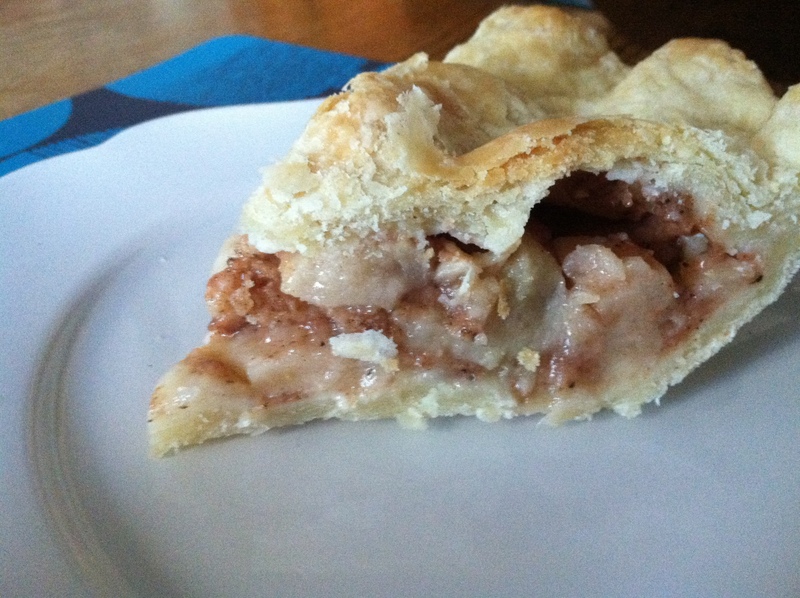 turn it up a notch and add a little excitement to the classic apple pie recipe. I brought it in to work and one coworker who had a piece told me it was so good she dreamt about it that night. High praise! Some people have told me they are intimidated about making pies but I really think they are one of the easiest things to make as long as you have an ounce of patience when it comes to making your own crust. It’s really not that hard, I promise! The crust recipe below calls for half shortening, half butter, though you could make it with entirely one or the other if you like. In general I avoid shortening like the plague as it is usually so processed that a tub of it would outlive us all and then some, but I have found an organic, 100% palm oil version from Spectrum that I really like and feel better about using. It does add a nice flakiness to the crust. Remove one dough disk from the refrigerator. Roll out the dough on a lightly floured surface and fit it into a 9-inch pie pan. Trim the crust overhang to 1 inch, then place the crust in the refrigerator while you prepare the filling. Using either a mortar and pestle or a spice or coffee grinder, grind the cardamom seeds (if using), black tea, while cloves, and peppercorns to a powder. Pour the ground spices into a fine-mesh sieve placed over a small bowl. Gently shake the sieve so all but the larger pieces fall through. Discard the larger pieces left in the sieve. 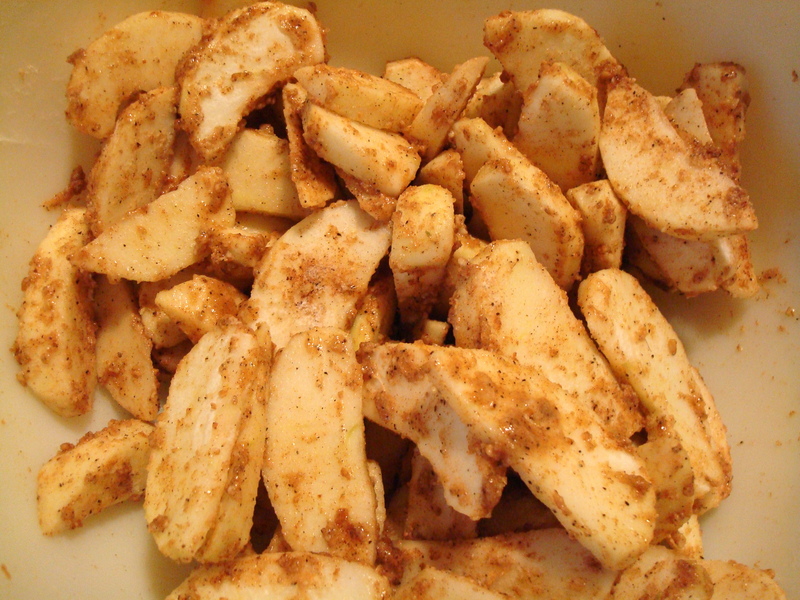 To the freshly ground spices in the bowl, add the ground cardamom (if using), cinnamon, and ginger. Whisk well to combine. Combine all of the filling ingredients, including the chai spice blend, in a medium-sized mixing bowl. Using either clean hands or a large spoon, toss until all of the ingredients are fully combined and the apple slices are evenly coated. 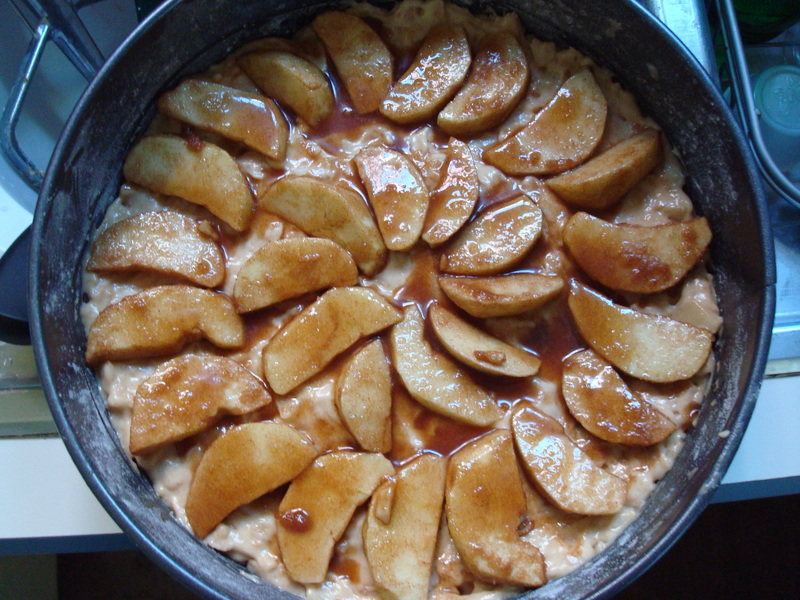 Pour the apple mixture into the prepared crust, mounding in the center. Dot the surface with diced butter. Roll the remaining dough disk into a 12-inch circle. Use a small pastry cutter to cut decorative images in the dough, if desired. Roll the top crust loosely over your rolling pin and unroll it over the filling in the pie pan, making sure it’s centered. 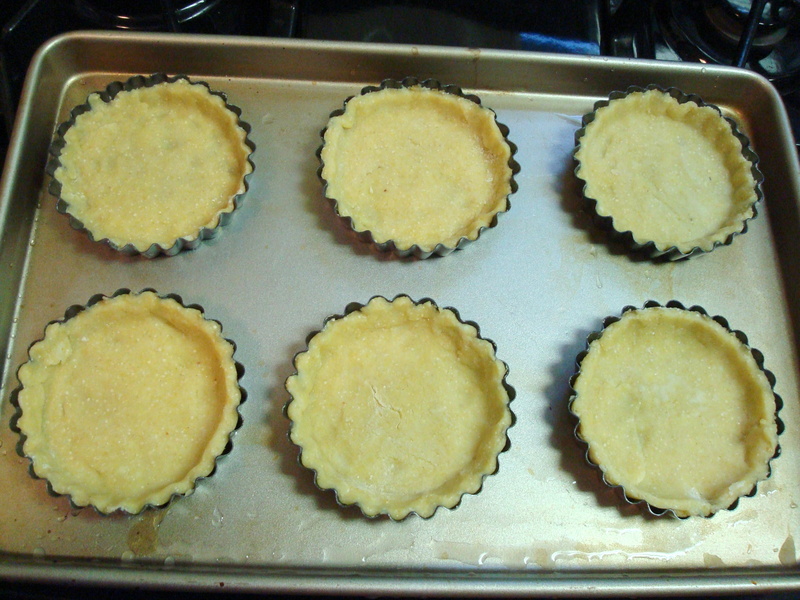 Trim the top crust overhang to 1 inch and tuck the edges under the bottom crust overhang. Crimp the edges decoratively. Place the pie in the refrigerator for 15 minutes. Place the pie on a baking sheet lined with parchment paper or aluminum foil to catch overflow juices and bake at 20 minutes. Reduce the oven temperatures to 375 F and continue baking for 30 to 35 minutes longer, until the crust is golden and juices are bubbling in the center of the pie. That I love baking is no secret but what I most love to bake is pie. Any kind of pie: strawberry rhubarb, apple with cheddar cheese crust, chess, hand pies, even peach pie with gluten-free crust. I love that there are now blogs dedicated solely to pie and bakeries that make nothing but, there was even a whole week dedicated to the subject on NPR. 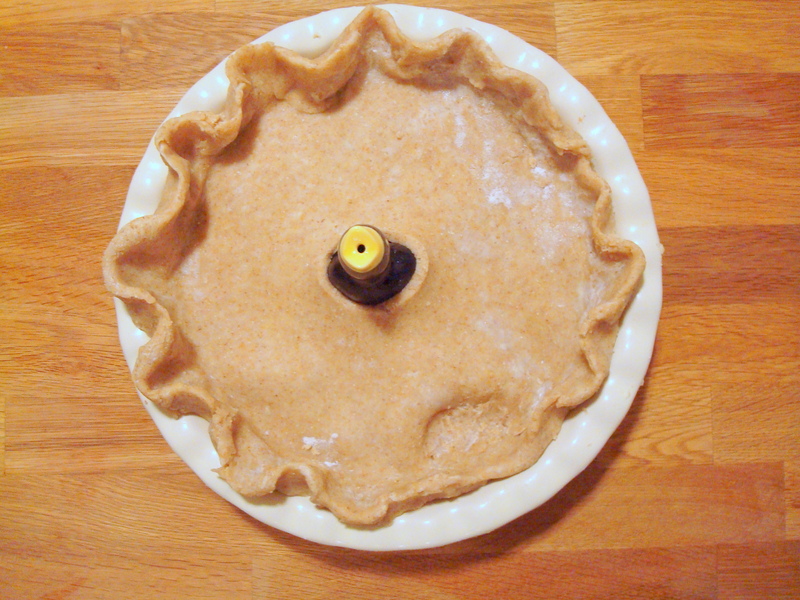 There were two things I had always wanted to try with pie but hadn’t up until last week and that was to make crust the old-fashioned way, with lard, and secondly to use a pie bird as the venting method. Lard is rendered pork fat so is obviously out for vegetarians and vegans and has also gotten a bad wrap for being high in fat, but it turns out it might not be as bad as once was thought. It actually is lower in saturated fat than butter. Not that I’m throwing the baby out with the bath water on butter anytime soon but lard might have its place in modern cooking too. It was easy to find a tub of it at my food co-op and was very easy to work with making the dough. I will for sure experiment with it more in the future. 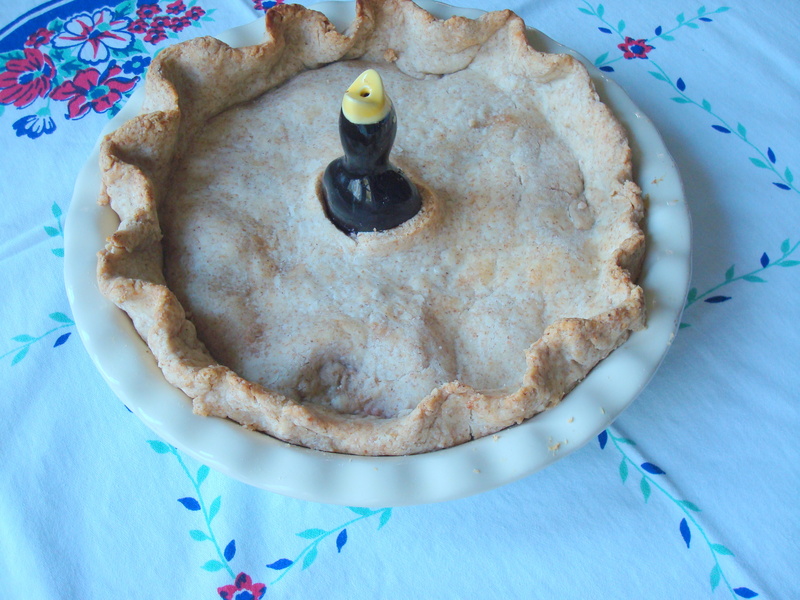 The pie bird was cute and also easy to work with but I will likely go back to my mom’s method of cutting the initial of the pie fruit with a butter knife into the top crust. It’s more nostalgic for me than the pie bird even though they’ve been around for ages. 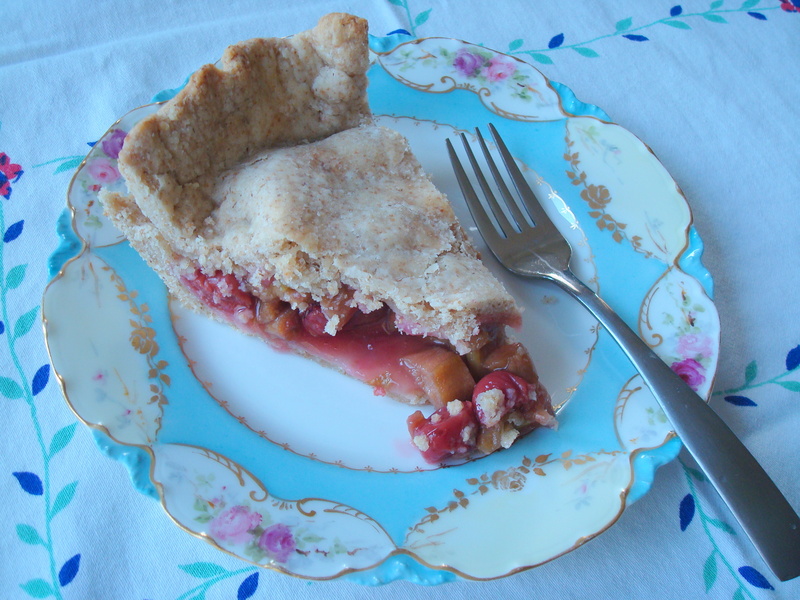 The filling for this pie consisted of what I had on hand in my freezer which happened to be cherries and rhubarb. What a great combination! It’s like when you make soup out of what you’ve got in your veggie drawer and it turns out unexpectedly amazing. Love it when that happens. 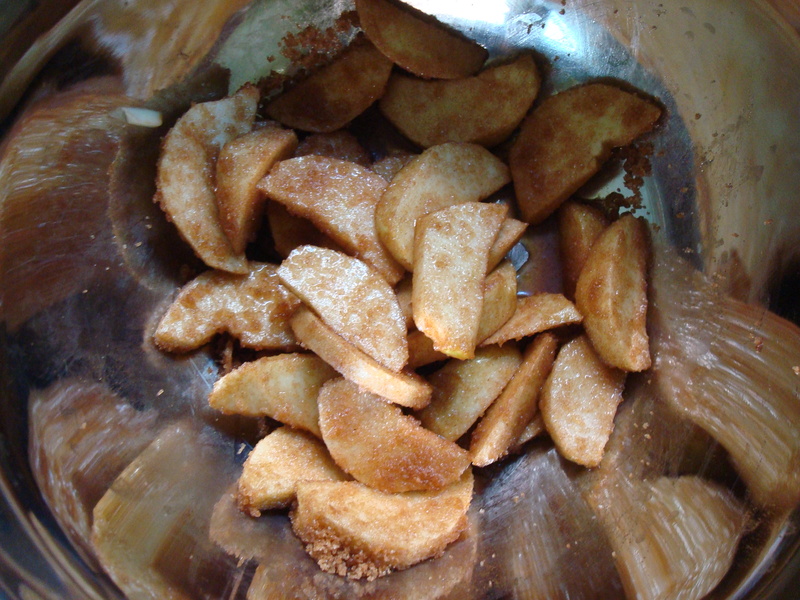 Blend flour, sugar, and salt in processor. 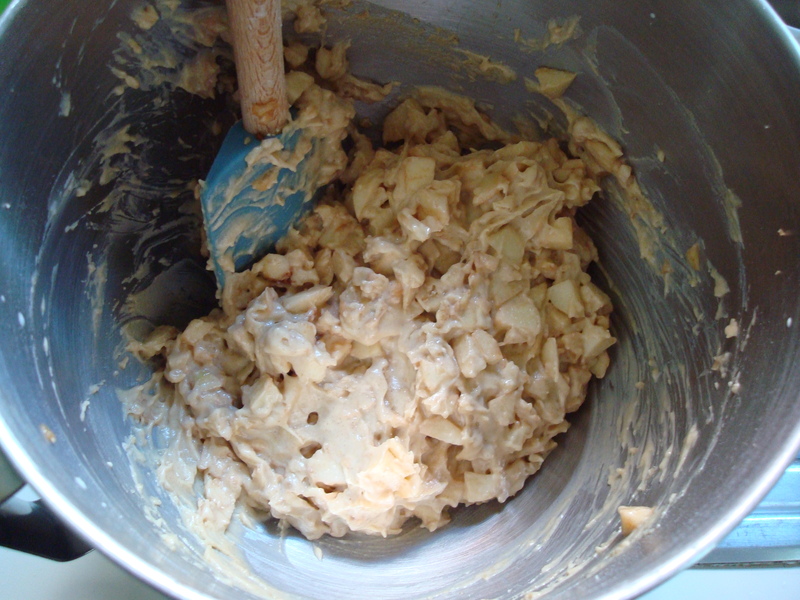 Add butter and lard; using on/off turns, blend until mixture resembles coarse meal. Transfer mixture to medium bowl. Add 5 tablespoons ice water and mix with fork until dough begins to clump together, adding more water by teaspoonfuls if dry. Gather dough together. Divide dough in half; flatten each half into disk. Wrap each disk in plastic and refrigerate at least 1 hour. DO AHEAD Can be made 3 days ahead. Keep refrigerated. If necessary, soften slightly at room temperature before rolling out. Combine all ingredients in bowl and let sit for 15 minutes. 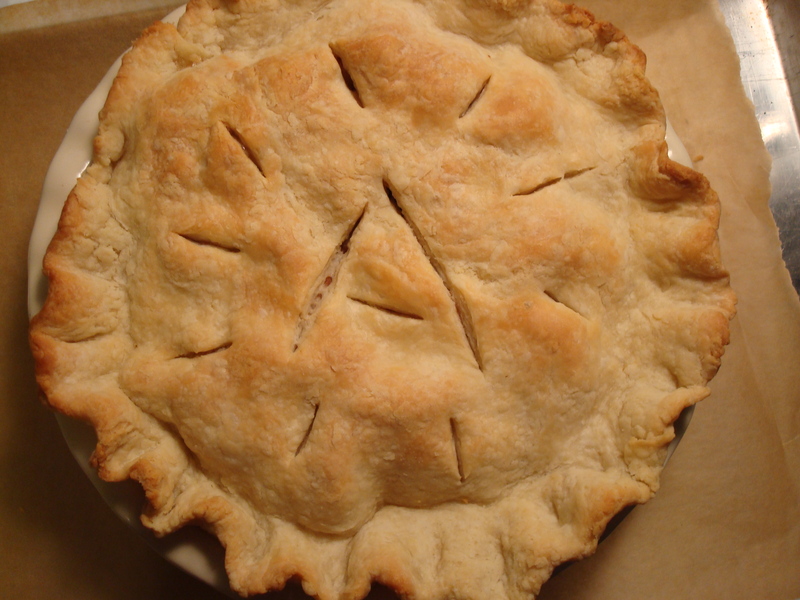 On a lightly floured surface, roll out one half of pie crust dough to fit into pie plate. Transfer pastry to pie plate; add filling. Roll out remaining pastry to fit top of pie. Place over filling. Trim, seal and flute edges. Cut slits in pastry. Bake pie for 40 to 45 minutes or until crust is golden. Cover edges with foil during the last 15 minutes of baking to prevent overbrowning if necessary. Cool on a wire rack. It has been way too hot to bake lately and I haven’t been doing a whole lot of cooking either. Trying to conserve energy– both my own and that of the electricity in my apartment. I don’t have central air and my little window unit only does the trick for about a third of the apartment and the kitchen is not in that third. No matter. I decided it was a good excuse to buy myself a new ice cream maker (as if one needs a good excuse!). The freezer bowl on my old one started leaking blue fluid everywhere which I’m guessing is not a good thing at all. It had to go. 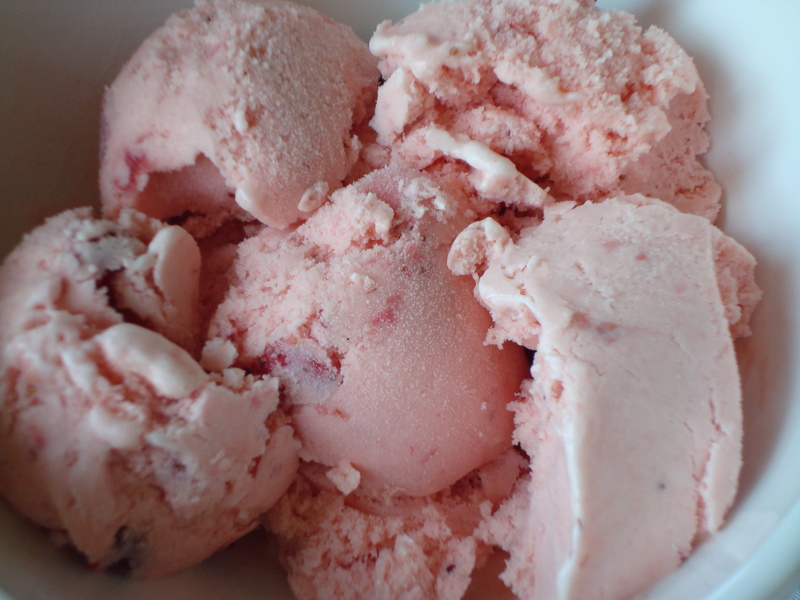 I bought some lovely strawberries at the market last weekend and they looked and smelled like strawberries ought to and while I generally think that ice cream should always involve chocolate in one form or another I have occasionally been known to choose strawberry as an alternative flavor. It just sounded refreshing in this heat. And man was that a wise decision. I could have slurped up the batter when it was more like a thick strawberry milk and skipped the freezing step where it turned into ice cream. It’s that good. 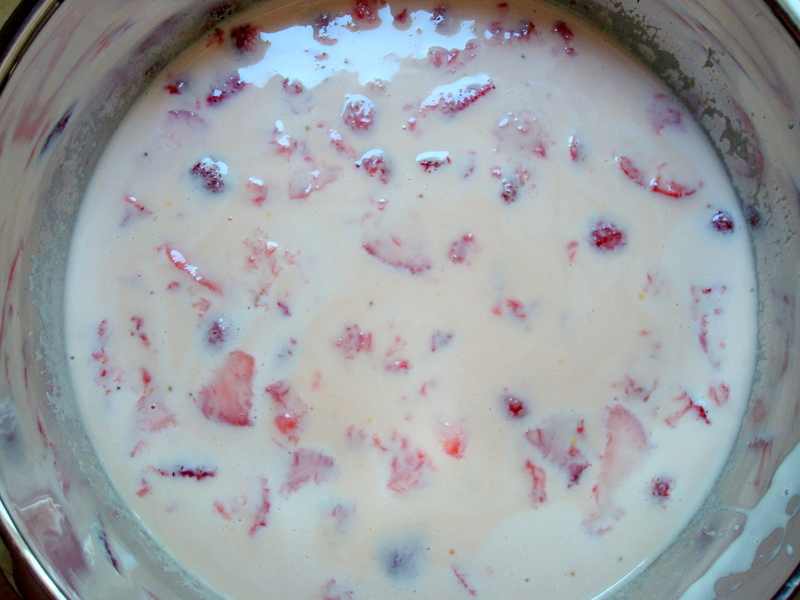 The addition of buttermilk really melds nicely with the strawberries– makes it little richer. In a small bowl combine the strawberries, ½ cup of sugar, and lemon juice. Stir gently and then set aside for 30 minutes to 2 hours to let berries macerate. Strain the berries, reserving juices. Mash or puree half the berries. Meanwhile, combine egg yolks and remaining ¾ cup of sugar in the bowl of an electric mixer. 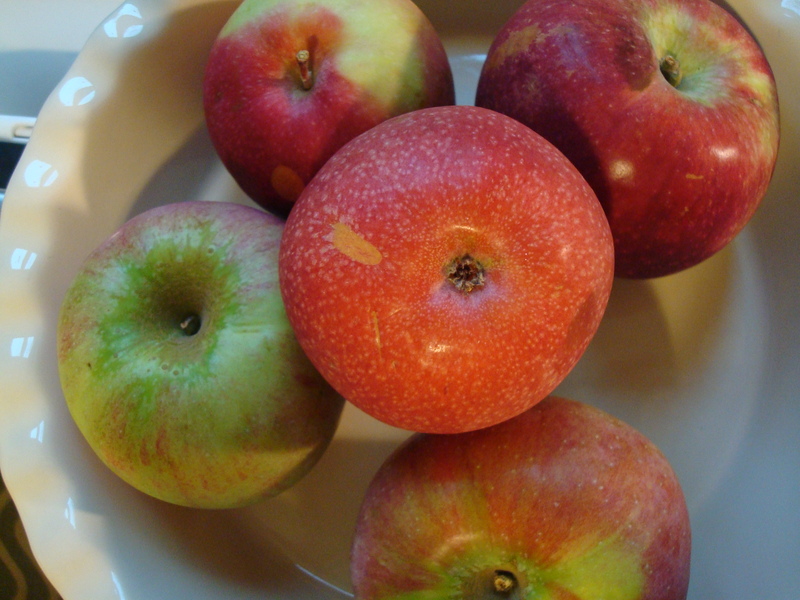 Beat at medium-high speed until very thick and pale yellow, 3 to 5 minutes. In a medium saucepan, heat milk and whisk in egg-yolk mixture over low heat. Stir constantly, until mixture has thickened enough to coat the back of a spoon. Remove from heat and immediately stir in heavy cream. Pass mixture through a strainer into a medium mixing bowl set in an ice bath until chilled, stirring from time to time. 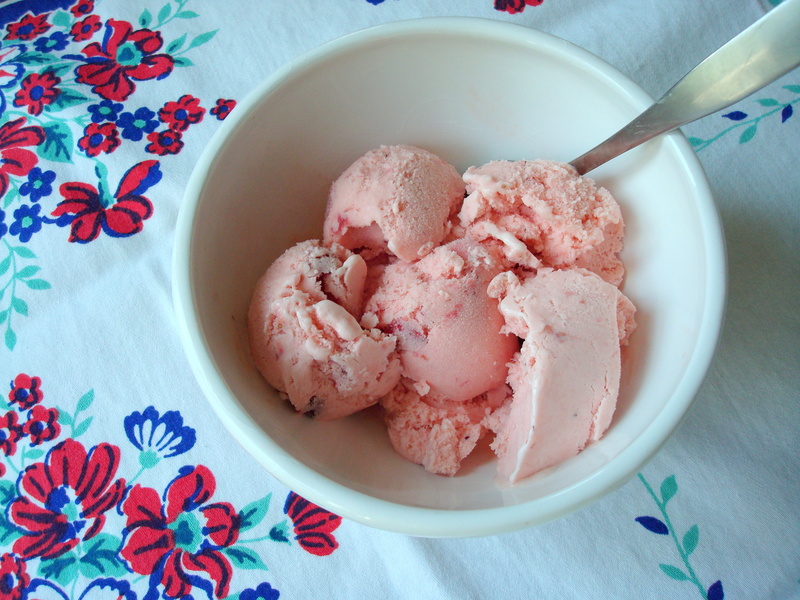 Stir in vanilla, buttermilk, and juice from strawberries along with the mashed strawberries, then freeze in an ice-cream maker according to manufacturer’s instructions. Five minutes before mixing is complete add the reserved strawberry slices and let mix in completely. Transfer to plastic container to store. 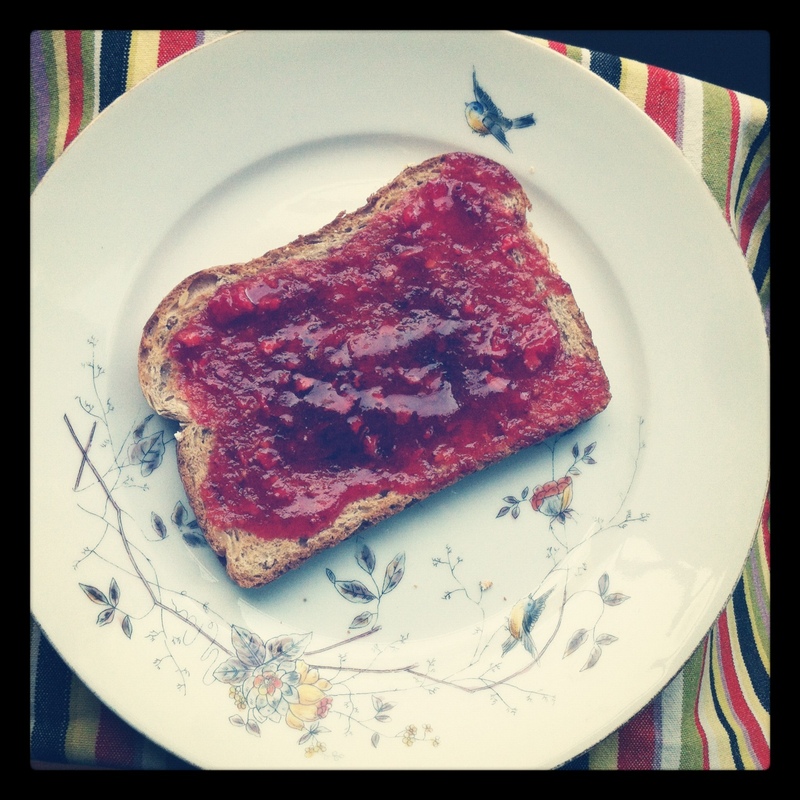 All of my adult life I’ve been on the hunt for jam that tastes as good as what my mom made when I was growing up. It’s been a pretty fruitless (no pun intended) search. There’s a Polish brand of preserves that almost hits the mark, but doesn’t quite. 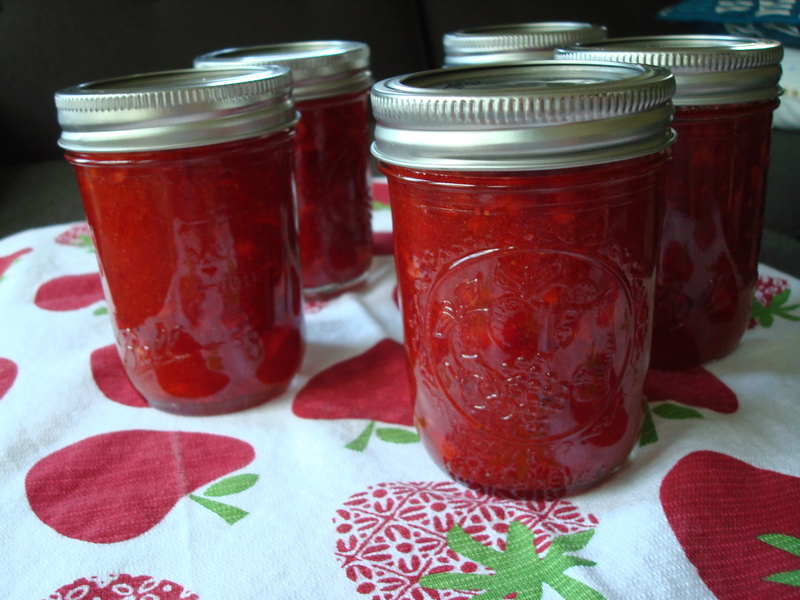 I’ve also tried many farmer’s market homemade jams over the years and while they are good and often involved multiple flavors in one jar (jalapeno-pear say, or blueberry-rhubarb), they tend to be on the expensive side and sometimes all you want is simple strawberry jam for your toast. My mom has told me for years that it is super simple to make but until last week I had never once attempted. How foolish I was! Once again, should have listened to my mom earlier. It’s one of the simplest things to put together and I have to admit I was kind of pumped picking up a pack of Ball jars for canning at the grocery store. Made me feel all resourceful and stuff. 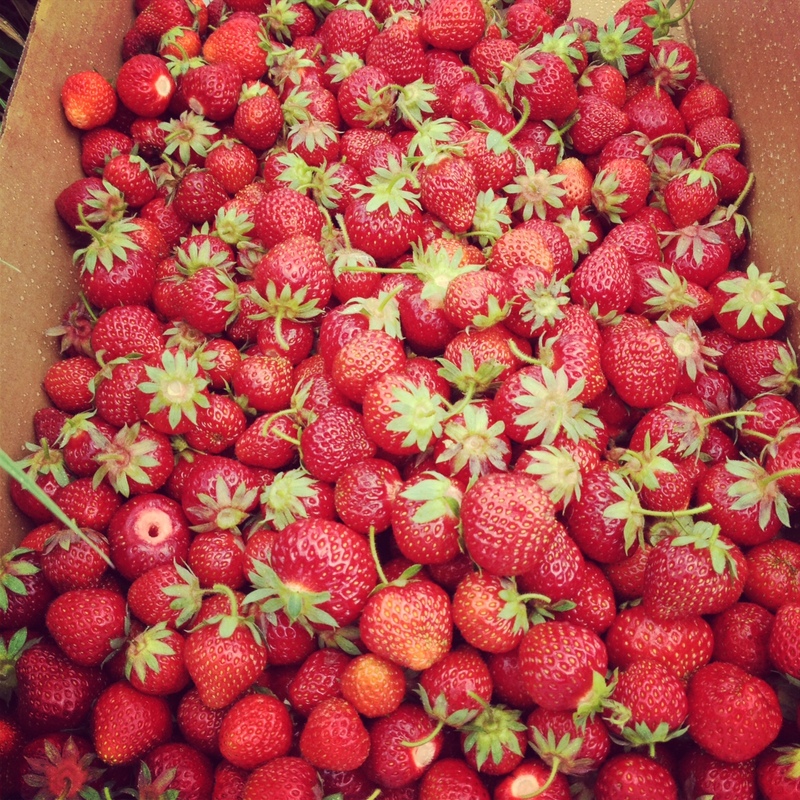 Crush strawberries with a potato masher or place in a food processor and pulse to finely chop. Do not puree. Jam should have chunks of fruit. 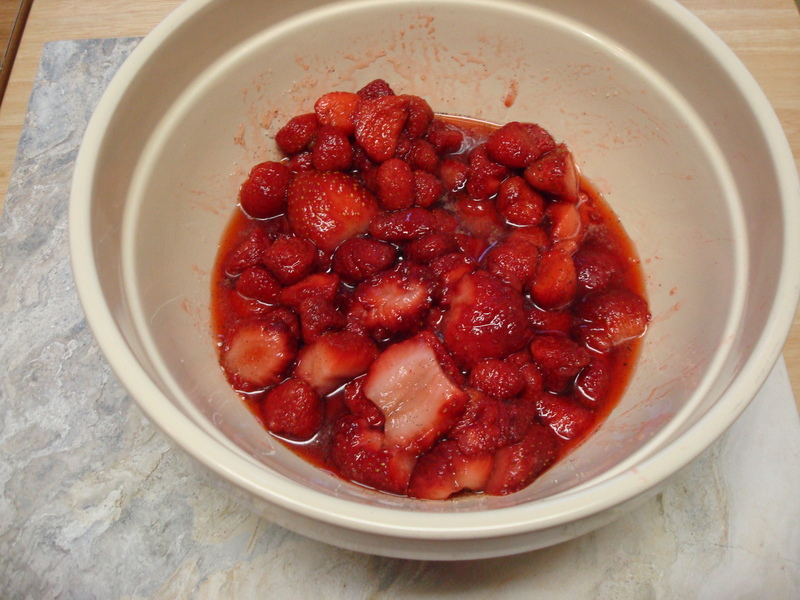 Measure crushed strawberries (you want 2 cups exactly, discard any excess fruit) into large bowl. Pour 4 cups of sugar over strawberries and stir. Let stand 10 minutes; stir occasionally. 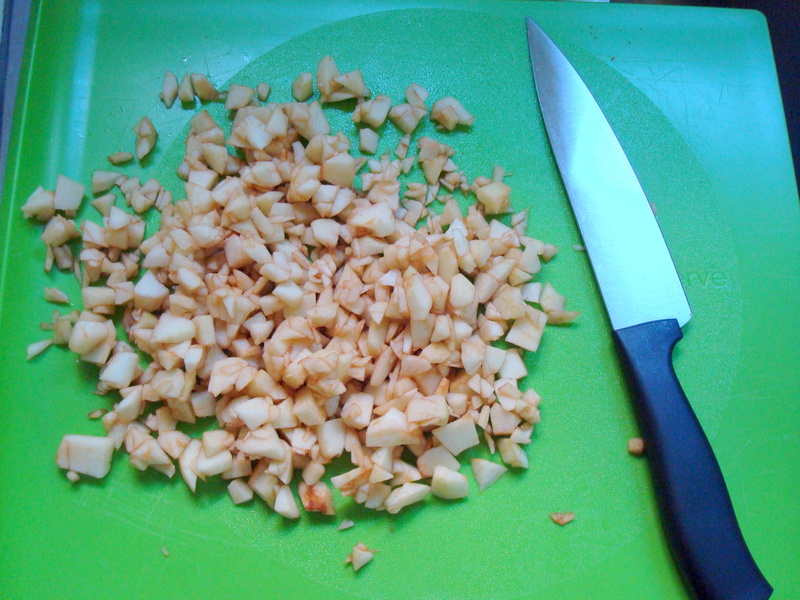 Stir 1 box of pectin and ¾ cup water into small saucepan. Bring to boil on high heat, stirring constantly. Boil 1 minute, stirring constantly. Remove from heat. 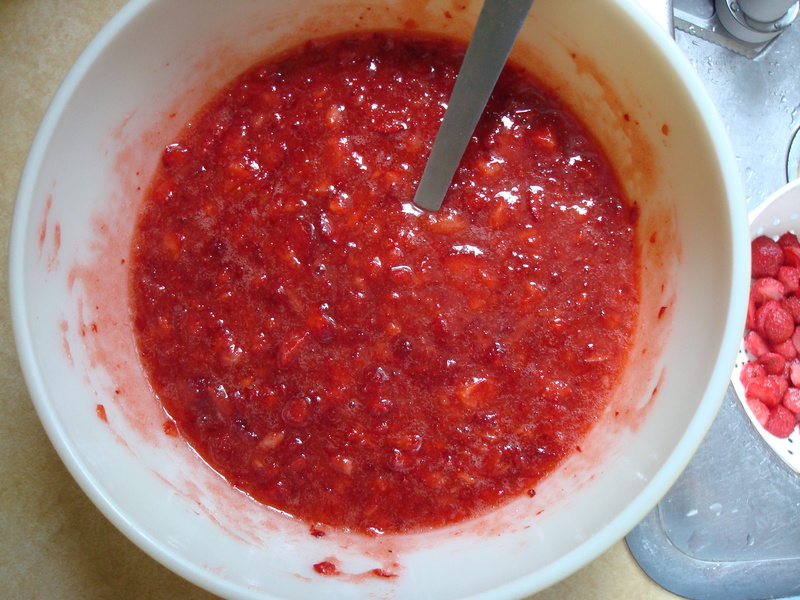 Stir pectin mixture into fruit mixture. Stir constantly until sugar is completely dissolved and no longer grainy, about 3 minutes. Pour into five 8 oz. 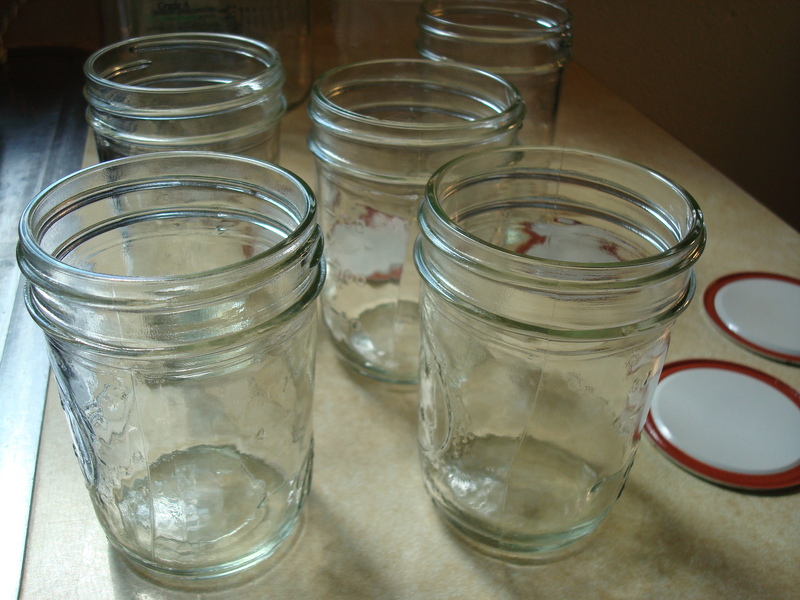 plastic or glass jelly jars, leaving a ½-inch space at top for expansion during freezing; cover. Let stand at room temperature 24 hours until set. Refrigerate up to 3 weeks. Otherwise, store in freezer for up to 1 year. Thaw in refrigerator.